Brooklyn is a sweetheart of a movie. Written by Nick Hornby and directed by John Crowley, it’s a remarkably faithful adaptation of Colm Toíbín’s lyrical award-winning 2009 novel about the emigration of a young woman named Eilis (pronounced “Aylish”) Lacey from Ireland to Brooklyn in the early 1950s. 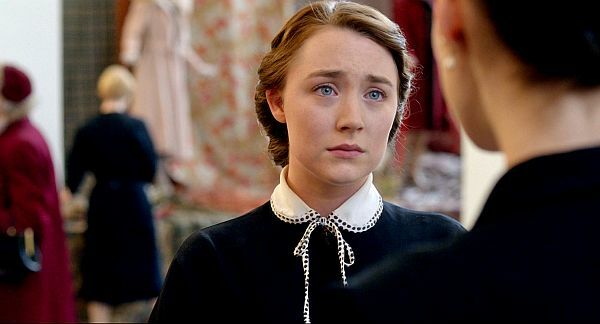 In a still-depressed post-war Irish economy, Eilis (Saoirse Ronan) is stuck: her sister Rose (Fiona Glascott) has a job as a bookkeeper, but Eilis can’t do better than land work at a small-scale grocery run by sour, stern-faced Miss Kelly (Brid Brennan), who lectures customers who show up on Sunday to buy items she considers non-necessities. Enniscotty in County Wexford is a narrow, parochial community, but it’s all Eilis knows, so when Father Flood (Jim Broadbent), an Irish priest in Brooklyn with whom her mother (Jane Brennan) is in touch, arranges lodging and employment for Eilis, she leaves with trepidation. The movie is about how she adapts to her new surroundings and makes Brooklyn her home and how it alters her. Hornby has judiciously eliminated Eilis’ three brothers, who, in the novel, have left home themselves to take jobs in Birmingham. (Their father is dead.) He begins the narrative after Eilis has already made the decision to leave home and within ten minutes of screen time he gets her on the ship, where her cabin mate in third class (Eva Birthistle), a hard-boiled, forthright Irish dame with a sympathetic nature, guides her through seasickness and offers valuable tips on getting through immigration. Hornby is one of my favorite contemporary novelists; his latest, Funny Girl, about a young woman who comes to London in the sixties to become an actress and winds up on a pioneering BBC comedy series, was one of the highlights of my summer reading. But his earliest screenwriting effort, on 2009’s An Education, failed to win me over: I didn’t buy the poise and maturity with which the heroine, a teenager in early-sixties London (Carey Mulligan), handed over her virginity to her considerably older lover (Peter Sarsgaard), or the unstinting willingness of her father (Alfred Molina) to entertain him as a marriage prospect. Since then, however, he’s turned himself into a first-rate screenwriter whose specialty is adapting other people’s books, Wild last year and Brooklyn this year. He turns out to have an unerring dramatic sense as well as the gift for writing dialogue that’s evident in his own novels. The director, the Irishman John Crowley, also began in another medium: he was a stage director before he started making movies in 2003 with Intermission, and though he’s only made a handful, I’ve enjoyed almost all of them. When he worked in the theatre he had a poetic touch and worked wonderfully with his actors; I saw a production he did in New York of Sean O’Casey’s Juno and the Paycock that knocked me out. That’s the quality you get in Intermission (which has an amazing cast) and Is Anybody There? (with Michael Caine) and Closed Circuit. 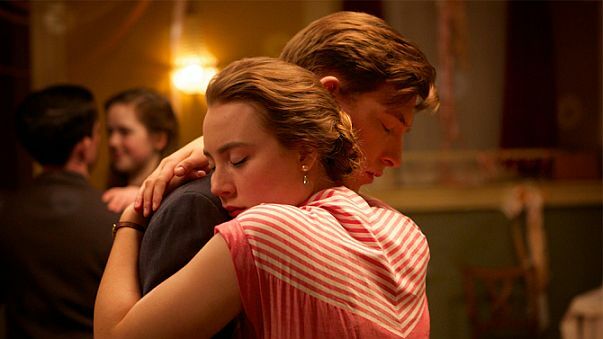 But Brooklyn isn’t merely well acted, though the entire cast, down to the smallest roles, is flawless. It’s a beautiful piece of filmmaking, very lightly and charmingly stylized in the comic scenes (like an Italian family dinner Eilis gets invited to) and with an understated poetic realism in the dramatic ones. (The evocative cinematography is by Yves Bélanger.) In the Ireland scenes, Crowley gets the mood of a local Irish dance, airless yet convivial, and the quite different mood of an Irish dance in Brooklyn, where the imported traditions feel nostalgic and somewhat moldy, shoehorned into an environment where they’re not quite natural, despite the abundance of Irish immigrants. He gets the feel of the boardinghouse, where the no-nonsense landlady, Mrs. Kehoe (the indispensable Julie Walters) refuses to mince words with her guests, who are all women and mostly Irish like herself. Here Eilis makes friends with Diana (Eve Macklin) and Sheila (Nora-Jane Noone), and their gossipy chatter shocks the pale, wizened Miss McAdam (Mary O’Driscoll), the sole middle-aged tenant, who voices the kind of unthinking devout Catholic mottos that Christopher Durang turned easily into absurdism in his play The Marriage of Bette and Boo. (When Eilis gets a job at a ritzy department store and she and the other young women discuss the virtues of perfumed soap, Miss McAdam proffers the opinion that plain soap was good enough for Our Lord.) The boarder who follows Eilis into the little community of the house, Dolores (Jenn Murray), is a wide-eyed country girl with a frizz of blonde hair whom Diana and Sheila snub and Mrs. Kehoe guilts Eilis into escorting to the dance. And Crowley gets the deep sadness of displacement in the scene where Eilis volunteers to help serve Christmas dinner at Father Flood’s church for poor pensioners – his attempt to give these men a taste of home. There’s a poignant moment when one of them (Iarla O’Lionaird) stands up at his place and sings an Irish ballad, and we see how it moves the others, and Eilis too, in her waitress’ uniform and cap (a fancy touch to pick up the special nature of the occasion). Some of the men, liberally liquored up, fall asleep at the table, and Eilis passes one sitting on the steps outside as she walks home through the lightly falling snow. Saoirse Ronan and Domhnall Gleeson in Brooklyn. When Eilis asks her shipboard companion, who’s returning to America after a visit home, how long it takes letters to get from Ireland to New York, she answers, “A long time at first . . . and then no time at all.” (This is a good example of Hornby’s deftness with a line.) In her early days in Brooklyn, Eilis lives from letter to letter, poring over the news from her mother and her sister as she sits alone in her room. At home in Ireland, Eilis has an easy social grace and, like both her mother and her sister, a sense of irony and humor that incorporates a healthy skepticism. But in her department-store job in Brooklyn, she’s shy and reserved with her customers at first, and she doesn’t know how to handle the flattery of the counterman at the diner where she eats lunch – interactions she would have had no trouble with in Ireland. Only after she’s been there for a few months does she begin to relax at work, after Father Flood enrolls her in a bookkeeping course at Brooklyn College that engages her mind. You recognize the voracious intellectual look in Saoirse Ronan’s eyes from Atonement, where she gave one of the best recorded performances by a child actor. She was thirteen when it came out; now she’s twenty-one, and in the gorgeous close-ups Crowley gives her she has the wide-screen expressiveness of a movie star of the big-studio era. Eilis’ playful wit returns when she meets Tony Fiorello (Emory Cohen), a young plumber who attends one of the dances because he likes Irish girls. Cohen has a smile of surpassing warmth, a muzzy, childlike vocal quality that reminds you of both Montgomery Clift and the young Aidan Quinn, and a delicate lope that suggests both a man’s-man’s ruggedness and a gentlemanly restraint. He and Ronan are lovely together. Tony takes her out on Saturday nights, and then he starts to show up outside her class to walk her home because it’s “too long a wait” between Saturdays. He declares his love for her before she’s ready to respond, but (in one of Ronan’s best scenes) she lets him know that she’s close to being able to convey her own romantic feelings for him. And when, suddenly, Rose dies and she feels the need to spend a month with her mother in Ireland, and Tony, terrified that she might not come back to the States, begs her to marry him quietly before she leaves, Ronan plays the scene with a kind of frightened enthusiasm. From the outset the filmmakers fill in the material dramatically in subtle ways. When Eilis departs, we see how much it means to lose her sister and even more what it means to their circumspect mother, who walks away from the port before the ship embarks because she can’t bear to see her daughter sail away. Jane Brennan lends a muted sorrowfulness to this scene, and to the one where she speaks to Eilis on the phone after Rose’s death. The movie makes a dramatic shift when Eilis reappears in Ireland and her family and friends insist on treating her return as permanent. She hasn’t told anyone, even her mother, that she’s married, and given the haste with which she and Tony wed, at city hall, it doesn’t feel completely real to Eilis either, especially in the light of her reunion with the folks she left behind. Her best friend Nancy (Eileen O’Higgins) is now engaged, so Eilis extends her visit so she can attend the wedding, and when she goes out with Nancy and her fiancé George (Peter Compton) they invite along George’s friend Jim Farrell (Domhnall Gleeson), who shows an interest in this newly sophisticated world traveler whose existence he barely seemed to take note of before she left. Her recently-acquired bookkeeping expertise makes her appealing to Rose’s old boss (Denis Conway), who hires her in her sister’s job and doesn’t take her seriously when she protests that it’s only temporary, to make a little cash and help him out. It’s all too easy for her to become absorbed in the old familiar ways, and suddenly this town where she couldn’t find a place for herself is full of promise. “I wish it was like this before I left – before Rose died,” she tells Jim. “There was nothing here for me before.” In her first days in Brooklyn, she could hardly wait to closet herself with letters from home; now, when Tony writes her, she puts his letters aside unopened. In the novel Toíbín almost leaps over the preparation for Eilis’ final shift; it isn’t a problem, but the movie needs to dramatize it, and Hornby uses a scene between her and the insufferably self-righteous Miss Kelly, her old employer, with her tight, smug smile, to accomplish the task. It feels a tad rigged, but it does the trick. My only other quibble is with Tony’s youngest brother, Frankie (James DiGiacomo), a mouthy, precocious little boy: when Tony doesn’t hear back from Eilis, he enlists the kid to edit his letters. It’s the only cutesy flourish in the movie, the only scene that feels false. Otherwise the movie is a small marvel of craft – the craft of the director, of the screenwriter, and of an ensemble of actors who seem inspired. A scene from Frederick Wiseman’s In Jackson Heights. 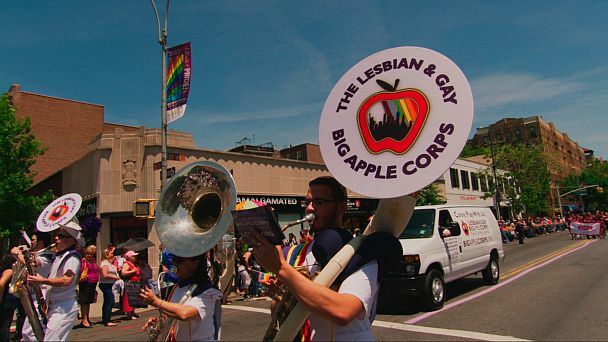 A few brief scenes into Frederick Wiseman’s three-hour-and-ten-minute In Jackson Heights, a study of the Queens neighborhood, councilman Danny Dromm talks to a gay community meeting about paying tribute to Julio Rivera, a Latino homosexual murdered locally in 1990, in the upcoming Pride parade. The parade, he boasts, will represent dozens of cultural groups because Jackson Heights, where 157 different languages are spoken, is the most diverse neighborhood in the country. Though the movie is typically complex and lingers on the challenges of dealing with the traditions, rights and grievances of a broad citizenry, the juxtaposed fervor of so many distinct interest groups gives it a jauntier quality than other Wiseman pictures, and though he always provides a fascinating cross-section of constituencies, here the ethnic variety makes it, literally as well as figuratively, multi-colored. In Jackson Heights is not only a splendid documentary; it’s a lovable one. Wiseman’s late-sixties and seventies work, which was first shown on public television, focused on institutions: High School, Law and Order, Hospital, Basic Training, Juvenile Court, Welfare. (Every one of those films is a masterpiece.) And though his impulses are always deeply humanistic – he is sympathetic to everyone who’s caught in an untenable system, not just those who are as liberal as he is – his exasperation with those systems is, of course, a political statement. But at some point politics went mostly out of his movies as he moved away from these multi-layered examinations of institutions to look at other, smaller kinds of settings, usually professional ones. Even his 1997 Public Housing, about a housing project on Chicago’s south side, is more distanced than something like Law and Order (which is about the Kansas City Police Department); Wiseman observes the interactions of community members with strong political stances but the outrage simmering beneath his pioneering early documentaries has long since dissipated. He couldn’t possibly have kept it up, and I don’t think it’s necessary to watch those seventies movies with longing; it’s not as though the man stopped turning out marvelous pictures. In At Berkeley, which came out in 2013, his depiction of the student activists and the administrators who lock horns is entirely disinterested. But though In Jackson Heights isn’t exactly a return to those faraway days of the seventies, you can feel him firmly on the side of everyone in the movie who is fighting for parity, justice and dignity. These include the Latino travel agent who is closing down his business after more than two decades because an influx of chain stores and the escalating rents charged by landlords who can’t make a profit otherwise is endangering small outfits like his (as well as the celebrated authenticity of Jackson Heights shops and restaurants); Mexican immigrants who get together to share stories of their harrowing experiences crossing the border and those of family members; and transsexuals who stage a protest march, stopping outside a store that discriminates against them. Make the Road New York, a grass-roots organization that fights on behalf of mistreated Latinos and other groups hears the case of a young man who claims he was forced to work extra hours without overtime pay because his English was poor and the case of Latina prostitutes who report a case of police harassment at a local bar (“We’re just trying to survive,” one of them explains). The movie is leisurely and it has its languorous moments, but Wiseman’s reach is amazingly wide and you keep getting pulled in. A group of gay seniors debate whether they should continue to hold their weekly meetings in the synagogue they’ve been renting out or find a place of their own in another town. A woman on her way to see her dying father in the hospital asks others holding Christian prayers in the street if they would pray with her on his behalf. Some white women knit together at a café and discuss the preservation of a local cemetery. My favorite scene is the quirkiest one, where a multilingual instructor holds a training session for immigrant cabbies preparing to take an exam to get their Yellow Taxi chauffeur’s license. And then there are the musical interludes: four women in a salsa band entertain in a park, a duo play a variety of percussion instruments in a laundromat, and a Latino folk band performs at a club. At the end, a man plays guitar informally at a community center while another man and two aging women join him on the lyrics of Mexican folk songs, singing with brio. Then Wiseman cuts to long shots of the nighttime Jackson Heights skyline, lit up with fireworks. (John Davey, Wiseman’s long-time collaborator, did the fine cinematography.) The celebratory mood seems appropriate.